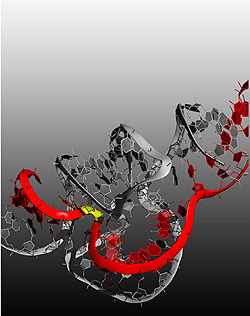 The hammerhead ribozyme is a self-cleaving RNA molecule. Image by M. Martick. Researchers at the University of California, Santa Cruz, have discovered a type of gene regulation never before observed in mammals--a "ribozyme" that controls the activity of an important family of genes in several different species. She and her coauthors are all affiliated with UCSC's Center for the Molecular Biology of RNA, directed by Harry Noller, Sinsheimer professor of molecular biology. As a graduate student working with William Scott, professor of chemistry and biochemistry, Martick had determined the three-dimensional structure of the hammerhead ribozyme. Note to reporters: You may contact Martick at (831) 459-5292 or martick@biology.ucsc.edu and Horan at horan@biology.ucsc.edu.